Our own unique mix of MicroGreens, containing at least 15 different herbs and greens. Many different colors and textures. Flavors range from citrusy to spicy to herbaceous. This aromatic, flavorful and beautiful mix will complement any dish including meats, poultry, appetizers, soups and salads! 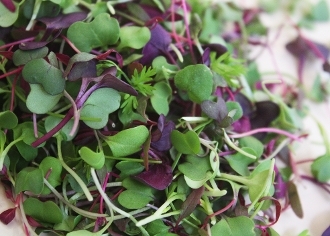 Top your food with Microgreens and bring your plate presentations to the next level!